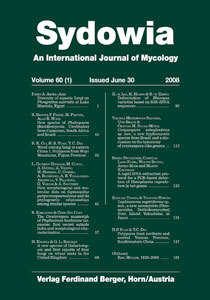 Cui B. K., Yuan H. S. & Dai Y. C. (2008) Wood-rotting fungi in eastern China 1. Polypores from Wuyi Mountains, Fujian Province. Field inventories on wood-rotting fungi from Wuyi Mountains , Fujian Province of eastern China provided 504 specimens representing 155 species of polypores, a list of which is given below with their respective hosts. Hapalopilus flavus is described as new and detailed description is provided.